Kitchens are an important hub of an active house and gathering place for guests and family. A well-planned kitchen allows ease of movement and complements the design aesthetics of your home. If you’re renovating your kitchen, make sure the design is both functional and aesthetically pleasing. A good Kitchen layout should have a work triangle between the three main task areas: food preparation, cooking and clean-up. For small kitchens, allow approximately 105cm aisles between zones. If your kitchen is large or if more than one person cooks at a time, aisles can be up to 120cm wide. However, if aisles are too wide, you’ll lose efficiency. Think about how you use your kitchen. The sink, prep area and fridge should be close together. The cooking area can be further away. Locate the refrigerator near the edge of the kitchen so family members have access without entering the cook’s working area. 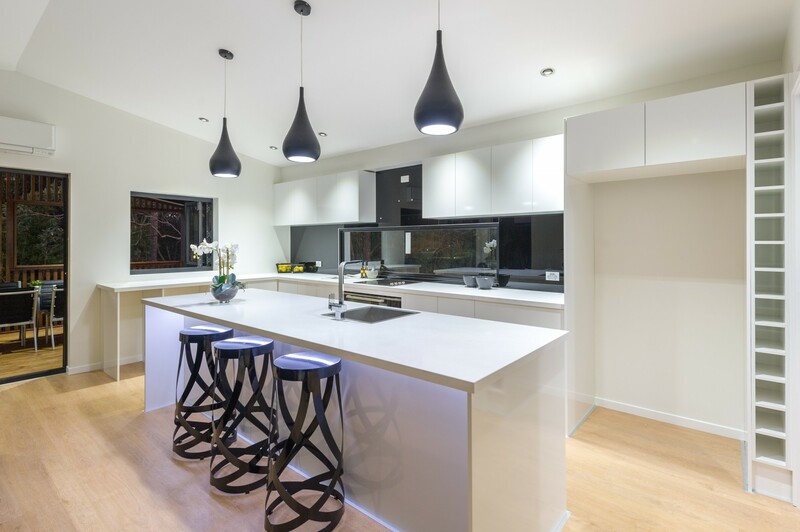 The height and placement of benchtops is as important as the amount of linear space. If you’re tall, raise the height of benchtops. If children cook, a lower benchtop accommodates their activities. Plan a landing space of at least 40cm on each side of the stove and fridge. Adequate counter space around the clean-up area is a must. Ideally, one side of the sink should hold dirty dishes and the other side should hold a dish drainer for clean items. If you use a microwave, electric kettle or coffee machine, make sure there is enough space for the appliance and the associated tasks. Adequate storage is essential in a good kitchen. Cabinets, drawers and pull-outs can be custom-designed to hold small appliances, cutlery, cookware and tableware. Glass cabinet fronts can help break up blocks of cabinetry. Pay attention to corners which are often wasted space. Look high. Display decorative items on open shelving over sinks and above cupboards. If you don’t have space for a walk-in pantry, maximise the food storage space you have. Pull-out organisers, hanging wire baskets and caddies for spices are a few practical solutions. Waste bins should be easily accessible to the prep and clean-up areas but can be hidden out of sight in a nearby cabinet. If the kitchen is also a place to entertain, designate an island, countertop or table as a gathering space away from food preparation. If children use the kitchen for homework and crafts, make sure it’s away from the stove or oven. If you eat in your kitchen, allow ample space to separate the dining area from work zones. Lighting is important for food preparation, cleaning and ambience. Amplify natural light with pendants, track lighting or chandeliers in styles that complement the rest of the decor. Track lights can also serve as spotlights for task areas. Lights under cabinets work well for prep and clean-up. Power points should be installed near major appliances including the fridge, stovetop, microwave and dishwasher. Add them along backsplashes, on islands and near the entertainment centre. If you cannot visualise your new kitchen, tap into our expertise. At Just Wardrobes & Storage, our design team works with you to optimise space while keeping your budget intact. We offer custom cabinetry and storage solutions for kitchens, pantries and dining areas. Our free in-home consultation includes a detailed discussion of your needs, a measurement of your space and a quote. Call Just Wardrobes & Storage today on 07 5502 2444 to schedule an appointment.